This PDF 1.6 document has been generated by QuarkXPress(R) 8.16, and has been sent on pdf-archive.com on 02/04/2016 at 18:45, from IP address 81.242.x.x. The current document download page has been viewed 444 times. File size: 5.4 MB (51 pages). in a fight for a crucial battery on D-Day. the men of Easy Company demonstrated unparalleled courage under fire. tells of his wartime and postwar exploits. hadn’t talked about his odyssey—until now. artillerymen in a fight for a crucial battery on D-Day. 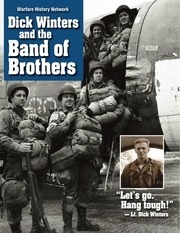 morning of D-Day––June 6, 1944.
of Easy Company when its CO, Thomas Meehan III, died when his C-47 crashed. where the battalion had set up temporary headquarters. Houck. Winters now had 17 men, including himself. caps. He would later regret it. left flank. The position resembled an L-shape with zigzagging trenches connecting each gun pit. and saw the Allied invasion fleet off Utah Beach. He rushed to the 6th Battery at 8 AM and immediately ordered the weapons manned and firing. one probing attack from elements of the 506th. consecutive gun, knocking it out until the battery was silenced. their right and provide flank protection. then ordered Malarkey to lead the assault. Suddenly, Winters realized that Malarkey had only grenades and was out of carbine ammunition. coming ashore at Utah Beach. weapon—the firing pin had broken. off across the field. Compton, a former college 2,000 yards from Utah Beach. This sketch shows the pobaseball star with aspirations of making the sition of the German guns. it at him. It exploded right above the man’s head, killing him instantly. Compton then waved the rest of the team forward. They piled into the trench and continued lobbing grenades at the other Germans. The first 105 was now in American hands. prone in the field, firing on Winters’s assault force. None of them had yet spotted him or Ranney. Lipton fired two shots at one of the prone Germans, but the man seemed to simply duck down. he aimed. Knowing that his first two shots had hit their target, he then opened up on the Germans. enemy realize how small a force they were fighting. man with a blast from his Thompson. Guarnere, so full of adrenaline and rage, missed his target. rushed the initial gun position,” Winters later noted. toward the second 105. The Germans were fleeing as he slid next to a dead German under the gun. panting while bullets smacked into the gun above him, dropping burning fragments onto his face. make his way back to battalion headquarters alone since he could not spare a man to assist him. assistant platoon commanders, joined the assault force. German fire was increasing. One of the German 105mm guns knocked out by Easy Company’s violent assault. the smoke cleared, everyone was covered in dirt but no one was hurt. they were getting hit from above. Some turned left and opened fire on the two exposed troopers. “Bullets were clipping branches and cracking all around me as I scrambled down,” recalled Lipton. He made it to the ground without a scratch. back toward Le Grand Chemin and retrieved it. On his return trip, he came across a group of American officers and men, all headed in his direction. he could say a word, a bullet struck Hill in the forehead, killing him instantly. guns quickly responded, tearing across the top of Winters’s trench. An opportunity had been wasted. quickly captured the second 105.
they captured each artillery gun. his targets and made sure every shot counted. The men charged the weapon. This file has been shared by a user of PDF Archive. Document ID: 00355960.